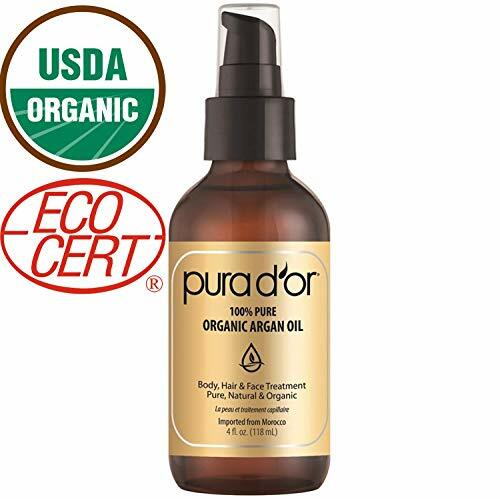 Pura d'or Argan oil is Hollywood's Best Kept Secret. Now Available to the Public! Organic Ceritifed by Ecocert through NOP. USDA Organic. Argan oil is also known as Liquid Gold due to it being the most expensive and rarest cosmetic oil today. In fact, that is the literal translation of our brand name Pura d'or. Pura means Pure and D'or means Gold. Pura d'or is Pure Gold, not only in words but in content: Get a bottle of this liquid gold argan oil today and you'll see for yourself! Benefits: -Anti-aging -Treat dry skin, eczema & psoriasis -Reduce facial blemishes -Reduce muscle pain -Reduce the appearance of scars -Effective moisturizer -Non oily, non-greasy & deep penetration -Reduce wrinkles -Treat dark circles under eyes -Mild anti-bacterial -Treat dry, brittle, frizzy & damaged hair -Protect from cold winds, pollutions & smoke Argan oil is all natural, cold pressed from the Argan tree native to South-western Morocco. No chemicals added and safe for all hair, skin and body types. It is a sharp contrast to the excessive chemical-rich cosmetic formulas found today in the market. BODY, HAIR & FACE TREATMENT. This pure, natural, organic oil restores elasticity, softens wrinkles and fine lines, heals dry scalp stimulating hair regeneration, and restores nutrient content to skin cells treating an array of skin conditions. EXCEPTIONAL QUALITY. 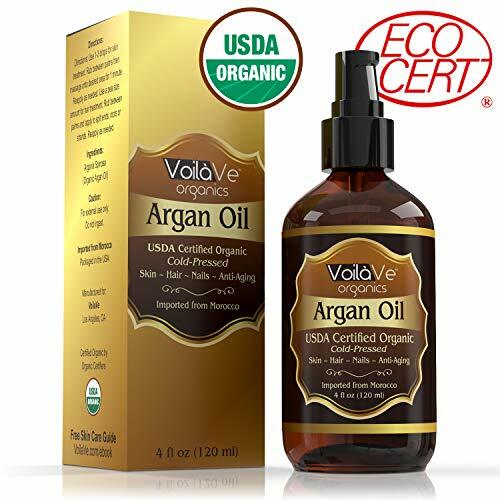 This 100% Argan Oil is manufactured using the highest industry standards. GENTLE YET EFFECTIVE. Specially formulated to effectively treat all hair, scalp and skin types. Gentle enough for daily use. SCIENCE + NATURE. All PURA D'OR formulas combine science and nature to deliver transformative hair and skin therapy. USDA Organic. Pesticide-Free. No SLS (Sulfates). No Parabens. No Artificial Colorants. No Synthetic Fragrances. No Harmful Chemicals, Gluten Free. Hypo-Allergenic. Made in Morocco. Color Safe. At Namskara, we believe in all-natural beauty solutions that deliver dramatic results! Extracted from non-GMO castor seeds, our USDA Organic Castor Oil is cold-pressed from 100% pure, hexane-free, all-natural castor bean plant (also known as palma christi). Used by A-List celebrities, models and reality-show stars, unrefined castor oil is the best-kept secret to luscious lashes, brows that wow, and shiny, voluminous hair! Our extra-virgin castor oil treatment can also be used as a moisturizer to boost anti-aging benefits for the skin, strengthen nails and cuticles and diminish the appearance of stretch marks! Our Organic Castor Oil comes with a USDA Certification to guarantee the highest standards of purity, potency and quality. To ensure best results, it is also vegan, free of hexane (castor oil hexane free) and artificial ingredients, cruelty-free, cGMP Certified and FDA Registered. Naturally contains a high concentration of hair growth vitamins and proteins (castor oil for hair growth) to prevent hair loss and promote long and luscious locks! Rich in Vitamin E and essential minerals, our Castor Oil for eyelashes can be used as a natural lash growth serum to help you achieve longer, thicker lashes! Comes with 2 applicator brushes for easy application! BROWS THAT WOW: Want to ditch the brow pencil? Our 100% pure castor oil will also help thicken eyebrows naturally! Naturally rich in Omega Fatty Acids, it can be used as a Castor Oil Moisturizer for instant hydration and anti-aging benefits (castor oil for skin)! This miracle beauty potion can also be used as a conditioner for cuticles, and can be used as a body treatment to diminish and conceal stretch marks! BOOSTS HAIR GROWTH: Extracted from raw castor seeds with the highest quality standards, this cold pressed castor oil for hair provides vitamins and nutrition for strong, long and thick hair. This premium hair growth treatment also helps regrow hair and prevent hair loss. PROMOTES GORGEOUS, GLOWING SKIN: Achieve supple, smooth skin with this unrefined castor oil treatment - rich in all-natural vitamins and fatty acids, it can be used as a castor oil moisturizer to hydrate skin and deliver anti-aging benefits instantly! #1 ALL-NATURAL BEAUTY SOLUTION: This organic extra-virgin castor oil is a real beauty remedy! It works as a natural eyelash growth serum (eyelash growth enhancer), conditioner, hot oil treatment, moisturizer, and mask to boost beautiful hair, eyelashes, brows and skin naturally - without the harsh chemicals! 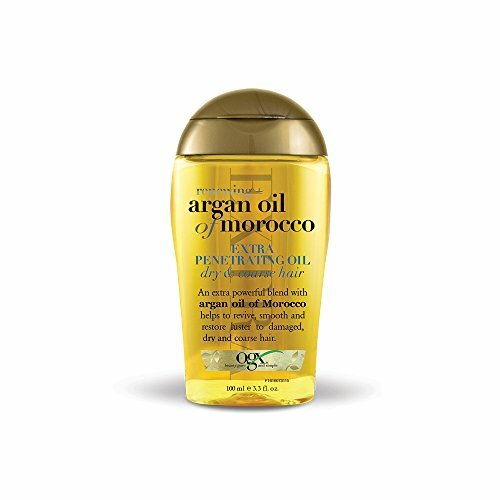 Help restore your hairstyle's shine and softness with this renewing Moroccan Argan Oil, extra strength formula helps strengthen and moisturize coarse and damaged hair. After shampoo and conditioner, evenly apply a small amount of Moroccan Argan Oil to damp hair from the roots of your hair through to the ends. This paraben and sulfate-free hair oil seals in moisture and shine for long-lasting protection. Works with blonde to dark hair, thick, dry, curly, frizzy and color-treated hair types. If you're looking for a natural and organic oil to revitalize your hair and give your skin a radiant and vibrant look, Kate Blanc's organic jojoba oil is a Godsent. Kate Blanc's Argan Oil is organically grown and cold pressed with no added preservatives. Because it's 100% pure, it easily absorbs into your skin and won't clog pores nor cause breakouts, leaving you looking fabulous. It's also great to use as a natural moisturizer. Our buyers love it and so will you and your skin and hair. This oil will leave your skin and hair stunning, vibrant, and full of compliments. Hair Treatment * Organic Argan Oil removes split ends and can be used with shampoos. Skin Treatment * Organic Argan Oil is the perfect moisturizer during the harsh winter season because it absorbs into skin quickly and is non-greasy, leaving you smelling fabulous. 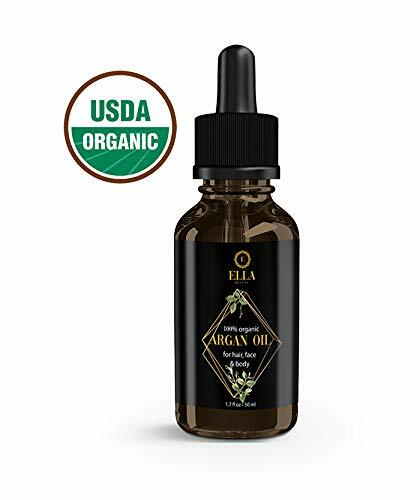 Facial Treatment * Organic Argan Oil is rich in antioxidants for anti-aging and anti-wrinkles and does not clog pores and help clear up blemishes and eliminate acne scars Grab a bottle today and delight your skin and hair. It's less than $10! 100% Money Back Guarantee If you are not satisfied with your purchase - for any reason at all - ask for a refund and your money is back in your account in 24 hours. No quarrels... no qualms... That's my promise to you. Kate Blanc Founder & CEO Kate Blanc Cosmetics Click Add to Cart and delight your skin and hair today. 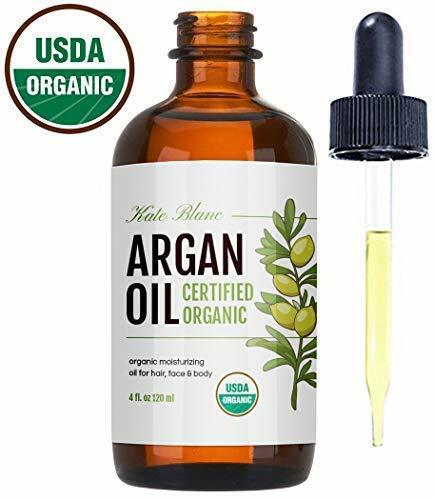 USDA CERTIFIED ORGANIC MOROCCAN ARGAN OIL - Kate Blanc's Virgin Cold Pressed Argan Oil of Morocco is certified by USDA and is guaranteed to be authentic, pure, natural, unrefined, and hexane free. 100% Guaranteed Authentic or FULL REFUND. HEALTHY AND SHINY HAIR - 100% Pure Argan Oil can help heal dry scalps, repair damanged hair, frizzy hair, and dead hair. Argan oil is a great elasticity treatment for hair by replenish and hydrating it with natural vitamins. The glass dropper allow drops for face treatment and for nails to keep your hair moisturized. It is non-oily, non-greasy, and has deep penetration. STIMULATE HAIR GROWTH - Grow longer and thicker hair in a quick, natural way, while also diminishing hair loss. Organic argan oil is a natural hair treatment pack for dry brittle hair, dry scalps, and dandruff. It can help with non-greasy hair and can be used in hair growth serums, hair masks, anti-hair loss, shampoo, conditioner. Argan oil is a great hair growth infusion and cuticle oil that can protect from cold wins, pollution and smoke. SMOOTHER SKIN - Keep your face moisturized and reduce blemishes, acne, pimples, scars, wrinkles, dark circles, eczema, psoriasis, and fine lines without leaving your skin dry. Pure argan oil is a great organic skin care and is an essential oil for nail treatment. It is an amazing natural beauty product for men and women. It can be made into natural facial lotion or body butters. 100% GUARANTEE AND ONE YEAR WARRANTY - We aim to offer the highest quality and most authentic products. We guarantee your satisfaction. If you are not satisfied with your purchase, please return it for a FULL REFUND within 365 days. Add to Cart. If you are looking for a natural and organic oil to revitalize your hair and give your dry or oily skin a radiant and vibrant look, Kate Blanc's organic jojoba oil is a Godsent. Our buyers love it and so will you and your skin and hair. This oil will leave your skin and hair stunning, vibrant, and full of compliments. Here are some real customer testimonials. "I was hesitant to use oil as moisturizer since I have combination/oily skin, but after reading so many great reviews I decided to try it. This product is amazing! It's super moisturizing but it's light enough for my oily skin. I mix it with rosehip oil & it has dramatically improved the look of my skin overall, calmed my eczema, faded old acne scars, and evened out my skin tone. After using it for just a week I went out without makeup for the first time in a couple years! I would recommend this to anyone!" Grab a bottle today and delight your skin and hair. It's less than $10! 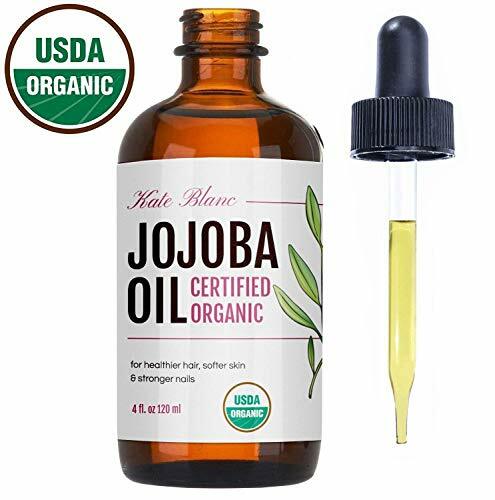 USDA CERTIFIED ORGANIC JOJOBA OIL - Kate Blanc's Organic Cold Pressed Jojoba Oil is certified by USDA and is guaranteed to be authentic, pure, natural, and hexane free. Proven results to soften skin, giving it a radiant and energetic look. 100% Guaranteed Authentic or FULL REFUND. GLOWING FACE AND HAIR - Perfect as a daily moisturizer or treatment for skin, hair and nails with proven results. Unrefined jojoba oil easily absorbs into skin and help remove wrinkles, stretch marks, and makeup. It's great as a lip balm and sunburn removal. STIMULATE HAIR GROWTH - Grow longer and thicker hair in a quick, natural way, while also diminishing hair loss. Pure jojoba oil is a natural hair oil for cuticle, dry brittle hair, dry scalps, and dandruff. Natural jojoba oil is also great as beard oil and for men and women. It's the popular ingredient in hair growth serum, lip treatment, and natural shampoo. SMOOTHER SKIN, REDUCE STRETCH MARKS - Clinically proven to improve skin hydration and skin elasticity after only four weeks. Jojoba Oil keeps your face and body moisturized and reduce blemishes, acne, pimples, scars, rosacea, eczema psoriasis, chapped skin, and fine lines without leaving your skin dry. Pure jojoba oil is a great organic hair oil and acts as a oil free moisturizer to repair hair. Castor Oil For Hair Growth - Making Your Eyelashes & Eyebrows Full Again! There is nothing like waking up to long eyelashes and stunning eyebrows. The best time to treat your eyelashes or eyebrows is before you go to bed. Just a small dip on your lash line or eyebrows and it could leave your eyelashes and eyebrows looking healthier than ever! ---------------------------Features--------------------------- - Naturally High in Vitamins - Rich in Omega Fatty Acids - Boosts antioxidants - Boosts Collagen & Elastin - Reduces acne & spots - Diminishes Wrinkles & Fine lines Active Ingredients In Every Drop When cold pressing castor seed, we extract all the ricinoleic acid from the beans. This chemical compound makes up almost 90 percent of castor oil, which is said to reverse hair loss. Other studies found that ricinoleic acid help inhibits PGD2 and potentially help scalp hair to grow back. Order PURA D'OR Castor Oil NOW! Within a few short weeks, you'll notice a difference, otherwise, we will refund you back every penny. STIMULATE FULLER AND LUSCIOUS EYE-POPPING EYELASHES. Give Definition And Shine Back to Your Lovely Lashes With Our Castor Oil Eyelash Serum. This premium eyelash treatment encourages healthy hair growth for stronger, thicker, and longer eyelashes. ACHIEVE THICKER AND DARKER ARCHES FOR YOUR EYEBROWS. When It Comes To Eyebrows The Bigger The Better. Drop those tweezers and naturally achieve fuller eyebrows with our 100% pure castor oil for eyebrows. FRESHEN UP ANYWHERE AT ANYTIME. Our Castor Oils Includes 2 Bonus On-The-Go Brush Mascara Wand And Bottles For Easy Application On Brows And Lashes. Both bottles come airtight so no leakage during your traveling commutes. RICH CASTOR OIL WITH SOOTHING SCENT. Pura Dor's Castor Oil is Made With Cold Press To Extract The Natural Oil Content From Castor Bean Seeds. This method leaves the oil safe to use while retaining the relaxing earthy scent. 100% 365 DAY MONEY BACK GUARANTEE. We Aim To Offer The Highest Quality And Most Authentic Castor Oil On The Market. We guarantee your satisfaction. If you are not satisfied with your purchase, please return it for a FULL REFUND within 365 days. 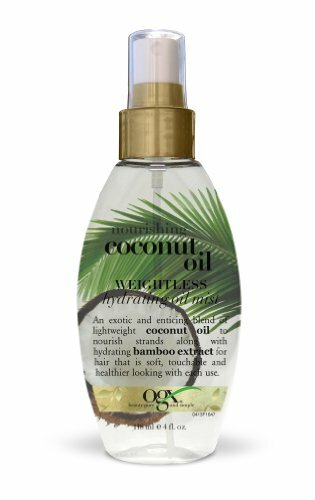 A lightweight formula blend infused with coconut oil and bamboo extract, the OGX Coconut Milk Weightless Hydrating Oil Mist that helps damaged hair and leaves it nourished, while coconut oil helps lock in moisture. Apply to towel dried hair and style. This hair spray oil mist can also be applied to dry hair in order to tame frizz. BEAUTY PURE AND SIMPLE: OGX hair care products are inspired by nature. We don't try to make hair look perfect because we'd rather make hair look fuller, smoother, straighter, curlier, or bouncier & smell irresistible while we're at it. ROCK WHAT YOU'VE GOT: OGX hair care products are designed to bring out the best in your hair, no matter what type or texture. Whether you need quenching moisture for curly hair, protection for colored hair, blowout cream, or matte pomade--we've got you. 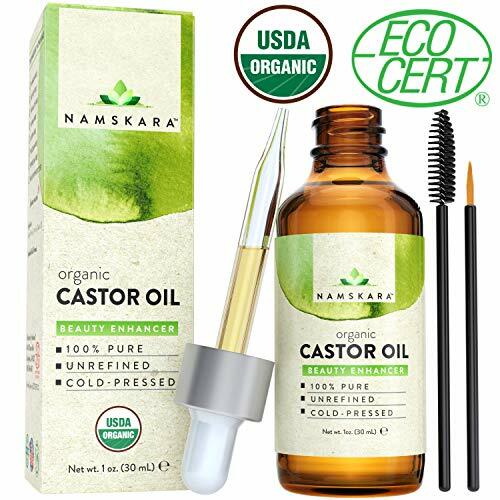 ORGANIC CASTOR OIL COLD PRESSED: Certified Organic by EcoCert and the USDA, our castor oil may be used as an eyelash and eyebrow growth serum, eyelash conditioner, scalp oil treatment for hair growth, and a nail treatment. HAIR GROWTH OIL - Used as a hair oil serum or scalp oil for hair growth, raw castor oil reduces hair loss. Rich in Vitamin E oil, unrefined castor oil helps you grow longer, thicker hair. This organic hair oil for dry hair helps rejuvenate dull and brittle hair. 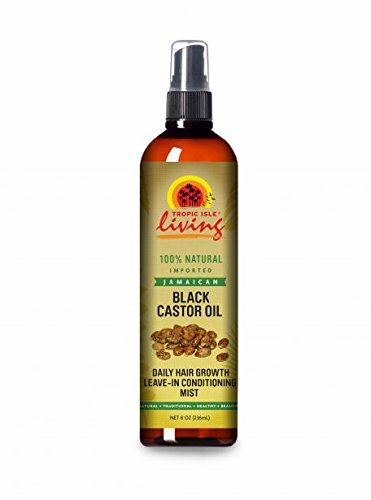 Use pure organic castor oil for hair growth or maximize results by combining castor oil with essential oils for hair growth and other hair oils for natural hair growth. Add to your hair care routine as a hair moisturizer for dry hair, hair serum for dry hair, hair oil for dandruff or scalp treatment for hair growth. Hexane free castor oil is suitable for all hair types and can be used by men and women. 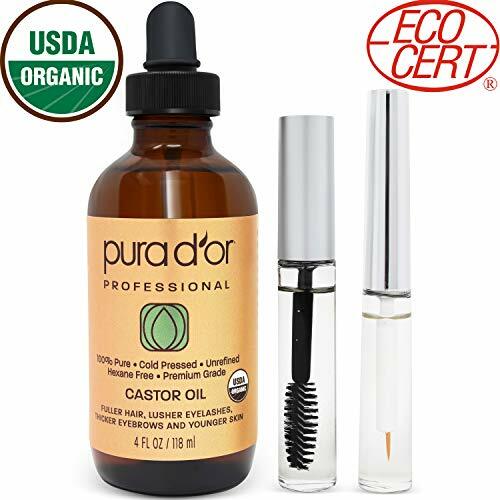 CASTOR OIL FOR LASHES AS AN ORGANIC EYELASH GROWTH SERUM - Use as natural lash growth serum for a lash boost to help you grow longer eyelashes, naturally. Pure organic castor oil for eyelashes works as a lash serum or eyelash enhancer growth serum for beautiful eyelashes. Used as a nourishing eyelash serum, it helps hydrate brittle lashes and minimizes lash fallout. 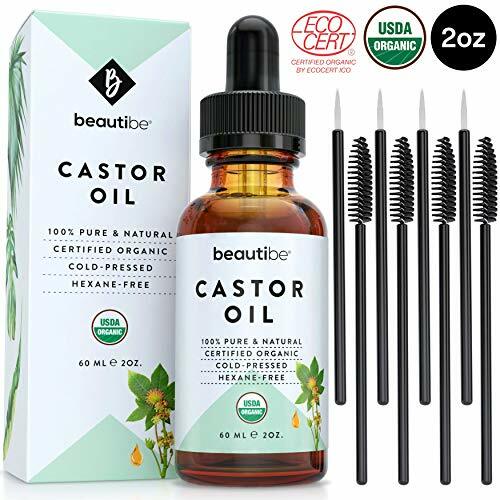 CASTOR OIL FOR EYEBROWS AS AN EYEBROW GROWTH OIL - This organic oil can be used an eyebrow serum and eyebrow enhancer to boost eyebrow hair growth and help you grow thicker eyebrows. Use this natural brow serum to boost brow growth for the best brows ever! INCLUDES A BROW KIT - This castor oil for eyelashes and eyebrows comes with 8 applicators - 4 mascara wands + 4 eyeliner wands - for an easy application. NAIL GROWTH TREATMENT - Apply a few drops of castor oil to nails as a nail growth serum. Great for Castor Oil Packs! We're proud to offer you organic products and natural hair growth products that deliver real results with simple plant ingredients. Click ADD TO CART to buy BeautiBe's Organic Castor Oil.  CERTIFIED ORGANIC CASTOR OIL - BeautiBe's cold pressed, hexane free and unrefined castor oil is Certified Organic by the USDA and EcoCert. Comes in an amber glass bottle for UV protection with dropper.  EYELASH AND EYEBROW TREATMENT - The applicator kit - 4 mascara brushes & 4 eyeliner wands - makes it easy to apply to eyebrows and eyelashes. Use as a conditioner for longer lashes and fuller brows.  STIMULATING HAIR GROWTH OIL - Grow longer and thicker hair, naturally. Use as a hair mask for growing healthy, think, long and shiny hair or as a scalp treatment to reduce dandruff and minimize hair loss.  MOISTURIZING SERUM FOR FACE AND BODY - Rich in Vitamin E, our raw, extra-virgin castor oil is perfect for all skin types and may be used as moisturizer for a beautiful full body glow from head to toe. Its healing properties help treat acne, minimize scars and stretch marks, reduce the look of fine lines and wrinkles, hydrate dry hands and lips, and strengthen brittle nails. May also be used in castor oil packs.  MANUFACTURER GUARANTEE - We believe in offering premium natural beauty products that offer real results with simple plant ingredients. That's why our organic castor oil is sustainably sourced from India and bottled in the USA according to the highest manufacturing standards. We're proud to be cruelty free and vegan and are confident that you'll love our 100% pure and natural castor oil. 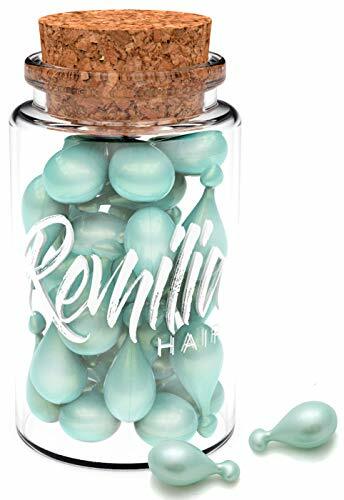 Remilia The Cosmocap Effective Hair Capsules Made in Italy for Dry Hair - Increase Shine, Reduce Frizz Treat yourself with new Hair Capsules perfect for all hair types! Turn heads and lock in moisture with this unique encapsulated hair serum for dry hair The Cosmocap. It is also a reliable, good hair serum for curly hair. Enjoy thicker, fuller and smoother hair with a beautiful, glossy salon finish. Hair damage happens with direct exposure to harsh UV rays, humidity, daily debris and dirt and sweat. The Keratin hair treatment is a mixture of powerful ingredients. It is formulated with pro-vitamin B-5, keratin amino acids & silk protein to repair, strengthen and hydrate. Our clinically tested hair repair serum effectively treats frizz, hair damage, and dullness. Specially formulated without GMO's, Parabens, Sulfates & Gluten, the Remilia hair repair supplement is ideal for dry and damaged hair and safe to use. The Cosmocap hair strengthening serum is made from plant-based and biodegradable materials and is thus non-polluting and safe to dispose. The box is made from recycled materials. Buy Remilia Hair Serum Today and Fall In Love With Your Hair Again! HAIR SERUM CAPSULES - Treat your hair with Vitamin B5 & keratin. Our protective conditioner is a tailor-made solution for oily roots, dry rough lengths, and unmanageable locks. Safe for color treated hair! MADE IN ITALY & CLINICALLY TESTED - Each Hair Oil Capsules tames frizzy hair and provides long-lasting nourishment. It promotes healthier, glossier, and thicker hair with vitamins, Argan Oil and keratin. SUITABLE FOR ALL HAIR TYPES - This smoothing blow dry serum contains silk protein, pro-vitamins and amino acid complex, making all hair types five times healthier without causing allergies or irritations. 100% GUARANTEE & 1-YEAR WARRANTY - We offer only the best hair deep conditioning treatment. If you are not satisfied with your purchase, you can return it within 365 days for a FULL REFUND. BIODEGRADABLE - We are committed to animal welfare and the environment. We don't directly or indirectly perform animal testing. Our keratin treatment doesn't cause any environmental damage. Davines OI Oil, 4.56 fl.oz. Color:Honey Treasures Leave-In Treatment | Size:5 Fl. Oz (Pack of 1) For every blend, there's Whole Blends, Hair Care blended with purpose, Because when the right ingredients come together something beautiful happens, We believe in the power of blends because Blended Makes us Better. 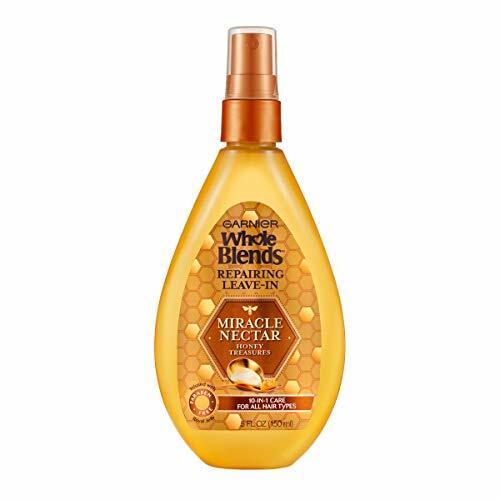 Whole Blends Repairing Leave-In Miracle Nectar Honey Treasures Treatment provides 10 Benefits in 1 Treatment and is blended with purpose with Honey known to replenish and Royal Jelly and Propolis known to nourish and repair. 10 Benefits including 1 Moisturizes, 2 Detangles, 3 Repairs and prevents split ends, 4 Tames frizz, 5 strengthens hair's fiber, 6 Restores softness, 7 Nourishes, 8 Protects against heat, 9 Reduces breakage, 10 Improves manageability. Garnier Whole Blends Miracle Nectar 10-IN-1 Leave-In is blended with purpose with Royal jelly, honey, and propolis extracts to reveal weightlessly nourished, silky hair, restored with strength & softness. Miracle Nectar Honey Treasures Treatment is paraben-free, crafted with select ingredients and unique fragrances, blended with purpose into nurturing, gentle formulas to help restore the natural beauty of hair with every use. Design.ME Gloss.ME Hair Serum It's (high) time your hair got the shine it deserves, and we've got the goods. Gloss.ME is a unique formula of oils and proteins, rich in essential fatty acids and vitamins A, C and E that make your hair stronger, fuller and healthier. The Tropic Isle Living Jamaican Black Castor Oil Daily Hair Growth Leave-in Conditioning Mist is specially formulated to Support healthy hair growth while adding moisture and manageability to the hair. Our Daily Hair Growth Leave-in Conditioning Mist is sure to leave your hair feeling stronger, moisturized, softer and more manageable. Great for all hair types. Adds Moisture and manageability to the hair. 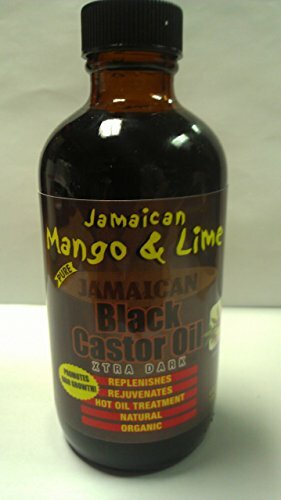 Made with 100% natural and effective ingredients such as Jamaican Black Castor Oil. Agadir Argan Oil Hair Treatment has been developed exclusively for the professional stylist. Its unique formula is based on one of the rarest oils of the world. This oil is known as Argan Oil or Argania Spinosa. It is 100% natural and certified organic. This amazing, leave-in treatment provides hair with a soft, silky feel and brilliant shine. 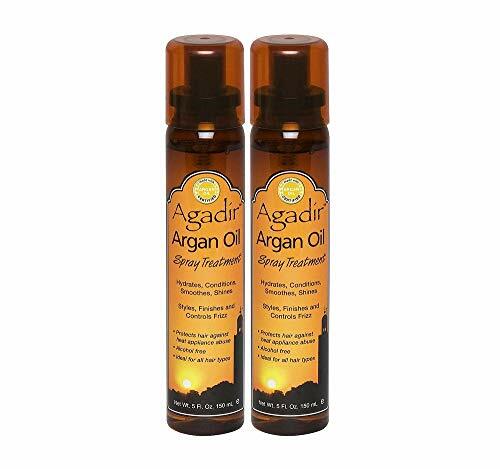 Agadir Argan Oil Hair Treatment is dry, non-greasy and absorbs instantly into the hair. Hair is nourished, moisturized and strengthened instantly. Excellent for repairing split ends, preventing breakage and color fade. Instantly repairs and adds elasticity to dry, damaged, frizzy hair. Instantly penetrates into the hair shaft without weighing hair down. Protects hair against heat appliances and chemical damage. Hydrates, conditions, smoothes and shines. Ideal for use with flat irons, blow dryers and other heat appliances. 100% Pure Cold-Pressed USDA Certified Organic Moroccan Argan Oil with no fillers. Beware of other Argan oils that falsely claim to be certified organic. If their bottles do not display the "USDA Organic" symbol, they are not certified organic. Our Argan Oil is the finest available and we have the certifications to prove it. ELLA beauty Organic Argan oil is produced using the highest standards in the industry, in Morocco, the only agricultural source of Argan oil in the world. Naturally rich in beneficial fatty acids, Vitamin E, and carotenes, our certified Organic Argan oil relieves severely dry skin and provides protection against cold winds, pollution, and cigarette smoke. HAPPINESS ASSURANCE: We back all our products unconditionally, so there is absolutely no risk to you when you purchase ELLA beauty Argan oil. If you are not completely satisfied, simply contact us and we will refund your purchase, no questions asked.